Musician Terry Bryant was taken into police custody late Sunday, just before midnight. The man LAPD officers say stole Frances McDormand’s Best Actress Oscar posted a Facebook video of himself brandishing the statuette shortly before his arrest. Deadline identified the suspect as Terry Bryant, 47, who was cuffed for felony grand theft. For most of the video, Bryant is discussing plans to attend various Oscar night soirées, hosted by the likes of Vanity Fair and Jimmy Kimmel (“I’m about to go to so many parties”). Within 30 seconds, Bryant states that he won the poached prize for both music and producing. According to his Bandcamp website, Bryant is a performer under the name D.J. Matari. In 2013, he released an album called “Greatness Is Living Inside of You.” His bail was set at $20,000 in the pre-dawn hours of Monday morning. 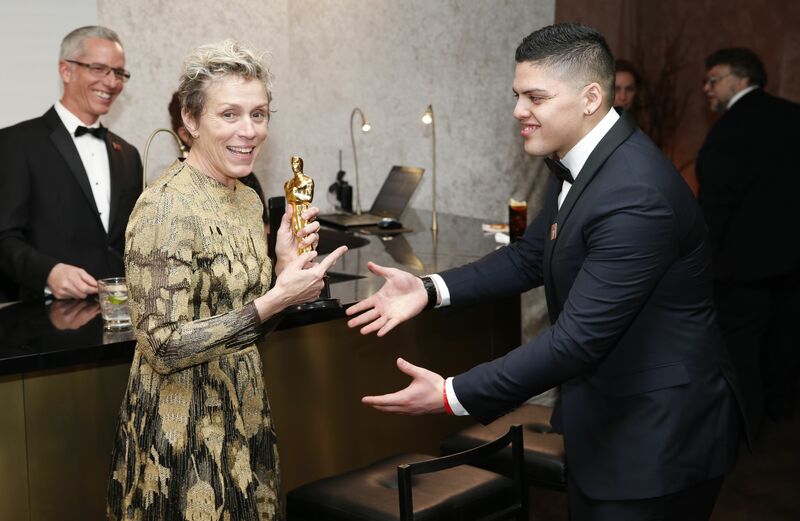 McDormand’s Oscar for “Three Billboards Outside Ebbing, Missouri” has been returned to her. Elsewhere on Bryant’s Facebook page, he claims to have been appointed a United Nations Goodwill Ambassador by the Golden Rule International. Watch the incriminating evidence below.